Should we read the Heather Graham books in order? 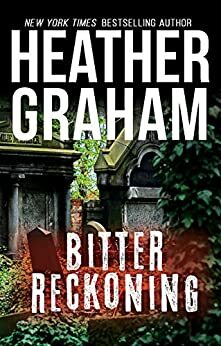 Reading the Heather Graham books in order is quite the treat to any romantic suspense lover, or to any reader who can’t get enough of paranormal romances or historical romances. While the author has written numerous books so far, her probably most popular series to date is Krewe of Hunters. 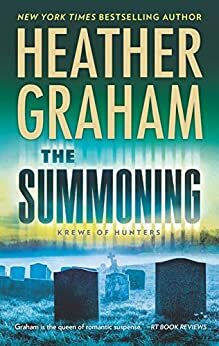 Below is the list of Heather Graham books in proper reading order for all her romantic suspense and mystery novels written over the years so far. Adam Harrison is an ex-paranormal investigator who creates a team / secret government unit whose sole purpose is to solve unusual cases. Each member of the team has some psychic powers that they can tap into to solve the crimes and investigate the paranormal. The Cafferty and Quinn series focuses on Danielle Cafferty – and antique shop dealer and Michael Quinn, a private investigator who team up to solve unusual crimes that police either wouldn’t touch or wouldn’t even know where to start looking for answers on. They become partners in life as well. Each novel in this series focuses on paranormal investigations involving other pairs of people. You can read the series starting with any book you choose, but as I am a stickler for reading them in order, I can’t help but read them that way. Heather Graham was born in 1953 in Florida, where she also grew up. After graduating from high school she married, however that didn’t stop her from pursuing a further degree. She attended the University of South Florida at Tampa from where she graduated with a degree in theater arts. After finishing school, she started working different jobs, ranging from dinner theater, singing backup vocals, to bar-tending. When her third child was born, however, she decided it’s time to work from home so she can be close to her children and to follow her dream: that of writing. So her writing career started. She sold her first book in 1982 under the title When Next We Love. What followed next was an avalanche of romances, romantic suspense novels, vampire novels, time travel novels, historical romances and much more in between. So far the author has written some 150 novels under various pseudonyms, including Heather Graham (her maiden name, under which she writes most of the romantic suspense novels), Heather Graham Pozzessere (her married name) and Shannon Drake (under which she writes mostly historical romances). The Heather Graham books have been translated into over 20 languages. 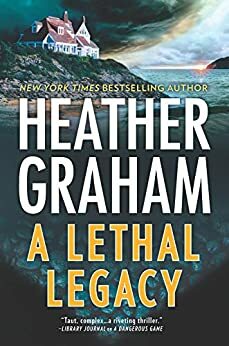 For her books, Heather Graham won several awards so far, including the RWA’s Lifetime Achievement Award, and the Thriller Writers’ Silver Bullet. 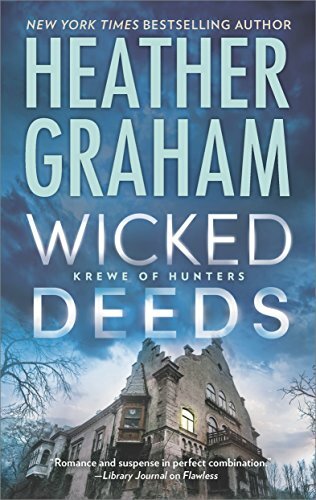 One of my favorite Heather Graham books in her Krewe of Hunters paranormal mystery series is called Wicked Deeds, the 23rd book in the series. Her latest standalone novel is the thriller American Drifter, published end of 2017. Wicked Deeds is book #23 in the Krewe of Hunters paranormal romantic suspense series. When the historian Vickie Preston and her new husband, FBI Special Agent Griffin Pryce, visit Baltimore for a romantic weekend before going home, they come across a murder in the basement of a well-known restaurant. A popular horror author, Franklin Verne, has been killed and things are strange around this murder. As both belong to the FBI’s Krewe of Hunters paranormal investigation team, they are asked to interrupt their honeymoon weekend and assist in the investigation because things are everything but normal surrounding this murder. So they begin to assist the local PD, which prompts a very dead author Edgar Allan Poe to reveal himself to them (in the form of a ghost, of course), saying that he wants to help solve the murder case. Since the Krewe team is all about paranormal, with every member having some sort of extrasensory ability, Vickie and Griffin are not overly surprised when Poe shows himself to them. Afterall, one of their talents is to see and speak with the dead. I loved this story, especially since one of my favorite classic authors, Edgar Allan Poe, was also involved. The book had a historical aura around it that I found charming. The characters were, as usual, engaging, and I loved learning more about the newlywed Krewe couple. The short story, Hallow Be the Haunt, is about another couple, Jake Mallory and Ashley Donegal, who are planning their wedding. Jake is a Krewe member, and he can’t wait till he weds the love of his life. But when they are at the bride’s plantation, around Halloween, of course, a ghost makes its appearance, warning Ashley about a serial killer who will start killing once again in New Orleans, the two know now that their wedding plans have to be put aside until the serial killer is caught. The book is relatively short, but if you love the Krewe of Hunters series, you will delight in reading it just as you enjoy all the full-length books as well. Two new Krewe of Hunters books are published in 2018 with the titles Pale as Death and Echoes of Evil, along with a short novella, Haunted Be the Holidays, to be released just in time for Halloween. I have read most the Heather Graham books so far, including the series and almost all the standalone novels, and this is what I suggest. You should read the Krewe of Hunters series in chronological order because you will get a much better sense of the various recurring characters. As for the Harrison Investigations, I honestly don’t think you will lose too much if you read them out of order as standalone novels. Each book is separate and they really connect through Adam Harrison (hence the name of the series). But all books feature different characters (unlike the Krewe of Hunters series where most characters feature in all books). The Flynn Brothers series is also worth reading in order, and the author’s newer series, The Finnegan Connection also, but really the series that should mostly be read in proper reading order is Krewe of Hunters. The rest, probably not so much. The Heather Graham book list is long so there are lots of novels to read. The one series that I truly couldn’t be without is, once again, Krewe of Hunters.